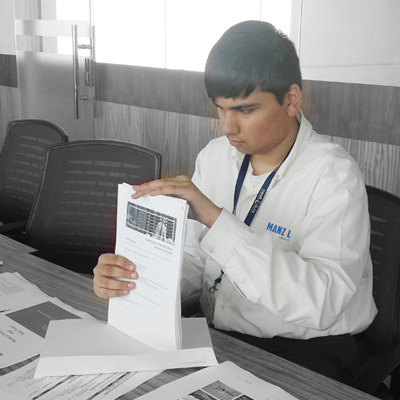 Every student at Manzil follows an individualized education program (IEP). The Education program follows a holistic approach comprising development of academic, self-help, cognitive, social, and motor skills. We provide therapeutic sessions for students who are not enrolled full-time at Manzil, including speech and language therapy, occupational therapy, physiotherapy, behavior modification and educational programs. Manzil provides the PRIDE program for students with mild to moderate intellectual challenges. The emphasis of the program is to develop students’ knowledge and skills to become a part of society. According to the students’ performance level they are placed in a work placement program either in the JOB [Job Opportunities in Business] program or the ME [Micro Enterprise] program. For a JOB candidate, the focus is career planning, including preparing CVs, on-the-job training sessions, learning office skills etc. This is an extensive effort which could span many years and would culminate in a tailor made pre-selected synergistic role within a chosen organization. Assessment of the work environment, accessibility criteria, job carving and training of the corporate team where the graduate is placed is an integral part of this effort. Post employment follow-up is a key component which ensures a successful integration of our Graduates into their new work environment. A ME candidate on the other hand focuses on enhancing his own inherent creative skill sets which will subsequently be needed in the internally run micro-enterprises. An example of a ME program is jewellery making by the students which is sold in various outlets across UAE. Customized corporate gifts and chocolates is another ME initiative. UAE’s first support group for families having individuals with Disability - Special Families Support - was the genesis of Manzil. It was started as a non-profit activity in December 1999 and grew to over 200 member families. We are also a part of the International Best Buddies Program. These constitute the Social Inclusion aspect of Manzil’s broader mandate. Manzil is proud to be chosen to roll out inclusive training programs for National Schools in UAE under an MOU signed between Manzil and the Ministry of Education. Manzil has participated in the International Autism Project lead by Dr. Christopher A. Walsh, MD, PhD, Children’s Hospital Boston and Harvard Medical School. It is an ongoing research effort focusing on the identification of autism genes and other brain development disorders through cytogenesis and molecular genomic approaches. This research can lead towards improved diagnosis and treatment of mental disorders. We led a research effort into identification & prevention of Child Maltreatment. A manual was prepared by us and training efforts were rolled out across many private & public schools in English & Arabic. The Manzil students as a part of the educational inclusion program have been going to these schools since 2008. They are a part of the academic as well as the extra-curricular programs of the Schools. Educational inclusion consultancy and actual integration of children on an ongoing basis. Being inclusive is also now a quantifiable part of the KHDA school assessment procedure. Assessing disability access, training of employees on how to engage with individuals with disability as well as detailed PRIDE program related job identification, matching and carving. Working with the UAE Ministry of Education to facilitate inclusion in Government Schools as well as running Career Fairs with the Community Development Authority of Dubai. The last Career Fair held in December 2015 saw 140 applicants and finally generated employment opportunities for 60 graduates!